A community clubhouse provides a convenient meeting place complete with a kitchen, dining & living area. In addition, a fitness gym area is located upstairs. 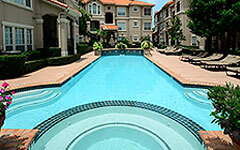 The swimming pool is located in the center of the community next to the clubhouse. Included in the beautiful setting is a whirlpool, waterfalls, and lounge deck with a barbecue area. Resident parking is provided in a multi-level parking garage located on the south side of the property. Residents enjoy private parking spaces in a gated, covered garage with controlled access.